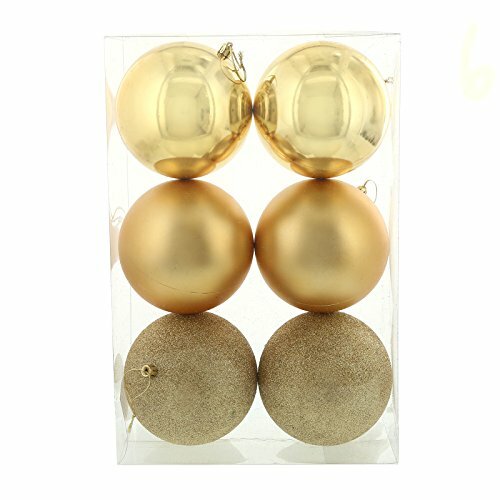 Must haves for the holiday season: Gold 120mm Ball Ornament Set. These versatile baubles can be used to adorn your Christmas fern or hung in clusters to accent your living space. Includes: (6) Gold 120mm Ball Ornaments. Must haves for the holiday season: Gold 120mm Ball Ornament Set. These versatile baubles can be used to adorn your Christmas fern or hung in clusters to accent your living space. Includes: (6) Gold 120mm Ball Ornaments. Set the scene with these beautiful, metallic gold Christmas tree ornaments! Featuring vibrant, assorted coloring to jazz up your décor this season! Add additional holiday decorations, tableware, favors, games and activities to celebrate and entertain your guests this season! If you have any questions about this product by BirthdayExpress, contact us by completing and submitting the form below. If you are looking for a specif part number, please include it with your message.